It has not proven easy to get info on this beast, makes it all the more fun! I just wish my niece was here, she lives in Moscow and is an Emglish/Russian interpreter. but I already knew all about the Cunliff-Owen blended body designs. When I saw this wee beasty I fell in love with it. The problem is just how to Militarize it, but I have that in hand. Well almost. I have several ideas I just have not decided which way to go yet. and you get a full set of masks with it. What a bizarre object. I'm looking forward to seeing how you build it. If the pilot is sitting in the centre, how does he see past the ruddy engine??? I think that may have been addressed earlier, but Wiki says: "The engine, with Townend ring cowling, was fitted on the centre-line between the font[sic? - Zac] cockpits which gave the pilot an asymmetrical view through the leading edge glazing." You have discovered a problem, Comrade! For you, a Hero of the Soviet Union badge and a session in the Gulag for exposing state secrets! Dah! 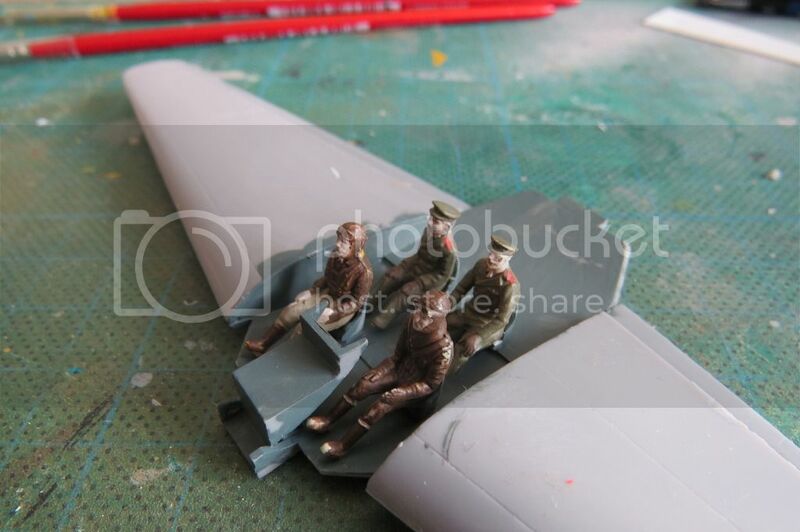 Work has recommenced and the cockpit interior is completed, the two aircrew and the two Russian Generals are in place. This was not without a few problems as the height and width of the occupants tended to foul the fuselage sides. After a fair bit of sanding, cutting etc. this is now sorted and here they are. Are the General's hats big enough? The General in the RH seat looks familiar. I think he might be related to the ex Airfix pilot flying my Caproni. They look excellent ! Going to be a really nice addition once she's buttoned up. They look about as comfy as you'd expect given that it's a Soviet machine. Looking forward to the topping out ceremony Jim. When the first Tu-95 Bear flew into RIAT in 1993 the accompanying general's hats there would have made excellent auxiliary flying surfaces for the aircraft, so large were they! Ah, but that was pure showmanship. The old "Ours are bigger than yours" swagger.